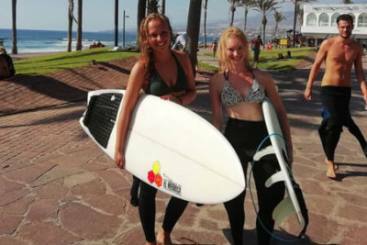 Internship Lanzarote - placements in Spain and in other sunny locations! Unbelievable natural spectacles can be observed on Lanzarote: El Golfo, the emerald green crater lake; the brakers at „Los Hervideros“, a wild lava coast and Timanfaya national park. There are 3 words to describe Lanzarote: art, nature, and architecture. There are many beautiful, little villages nestled by the beaches in the south and some surf districts in the north. Lanzarote is the 4th biggest Canary Island with more than 300 volcanoes, which have shaped Lanzarote’s landscape throughout the years. Since 1852 Arrecife has been the capital of Lanzarote. 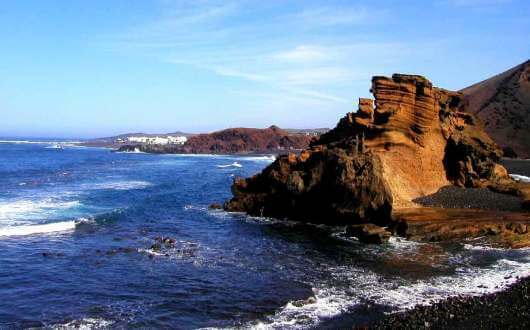 In 1993 the UNESCO has appointed Lanzarote as one of the “World’s Biosphere Reserves“. This nomination is awarded to habitats, where humanity and nature live in harmony with each other. Lanzarote has a lack of subterranean water, water is used very economically. Hence, the inhabitants do a lot in order to preserve their isle. 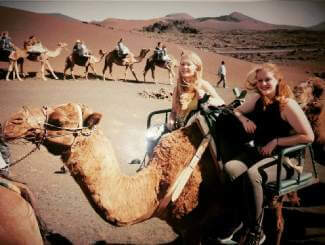 Moreover, on Lanzarote the potential for excursions is abundantly available. For a tour of the north of the island, your best bet is to start at Teguise, a picturesque city and former capital of the island. The trip includes travelling to fields of cacti in Guatiza and the viewpoint “Mirador del Rio”. The next stop is the worth seeing, lava grotto “Jameos del Agua” and Haría, the “Valley of a thousand palms“. In Haría you obtain a very exotic impression: cubic, white houses, which are reminisent of the architecture of northern Africa. You get a beautiful view over Haría from the Mirador de Haría. If you would prefer to explore the south of the island, you should take part in a camel ride at the bottom of the “Montañas del Fuego” (fire mountains) and afterwards go to the national park “Timanfaya”. And it is doubtlessly the highlight of Lanzarote’s landscape. During 1730 and 1736 smoke and lava came out of the fire mountains. Many parts of the land have been made barren by the lava and many villages have become dead land. For a better understanding, volcano documentaries are shown. The Timanfaya national park is also known as “eerie moonscape”. To get tour the whole park you should plan at least 3 hours. Yaiza, at the foot of the fire mountains is one of the most beautiful locations on Lanzarote and it is also a very typical one. Here, you should visit the Jardínes de la Era, the church Los Remedios (built in the 18th century) and the village square. Additionally, an excursion to the Canary Island “Fuerteventura” or one of the other islands could be an alternative option during your internship Lanzarote. Climate: Mild throughout the year, less rain, and springlike to midsummery temperatures. Location: Situated north of Fuerteventura, 140 km western of the Maroccan coast, in the Atlantic Ocean. 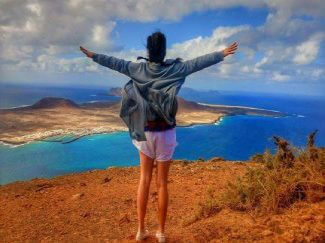 For your internship Lanzarote we have compiled an extensive list of minor and major attractions for you. bizarre formations of lava rock at the southern coast. In Arrecife you can go to a market on Wednesdays directly at the waterfront at the pedestrian zone. Among the dreamlike landscape Lanzarote offers a lot of touristic attractions which are worth to be seen. Without a doubt the places built by the force of lava and ocean are the most characteristic ones of Lanzarote. Together with its beautiful beaches and steep coasts, this unique countryside makes the difference in Lanzarote’s landscape. Here, many movies have been made because of its unusual scenery, and some of the most beautiful and interesting locations were co-designed by the artist César Manrique who was born on Lanzarote. They form the Centro de Arte, Cultura y Turismo. In the north of Lanzarote, at the foot of the volcano Monte de la Corona, there is the entrance of an 6 km subterranean gallery system, which is counted to the most interesting caves and grottos. “Jameos“ are caves of lava and emerge if a tunnel collapses. This often happens, if it’s getting broader than 20 meters, or if volcanic gases have led to an explosion. The visitor steps in through twisted wooden stairs into a 100 meters long and 30 meters broad open lava caves, the Jameo Grande, with its wonderful garden and the impressive swimmingpool. In the inner of Jameo Grande, you can find integrated harmonically bars and dancefloors for the nightlife as well as a big concert hall for evening events. You should not miss such an event during your internship Lanzarote, when the night will be turned into day and the Jameo Grande invites for a dance! We recommend you to visit during your internship Lanzarote the reserve Timanfaya – or Montañas del Fuego = called Fire Mountains, are located in the south of Lanzarote and extend over a huge impassable area. If you travel by car or bus, you can pass into the center of the park after you have paid the entry fee. From here, buses leave for a 20 minutes tour through the interior of the fire Mountains. A volcanic landscape, untouched by humans, presents itself to interested visitors and it is a really special adventure to see this. Even if the topic of volcanos is omnipresent on Lanzarote, here you get a detailed insight which is really worth to be seen. The aquarium of Lanzarote is the biggest aquarium on the Canary Islands. 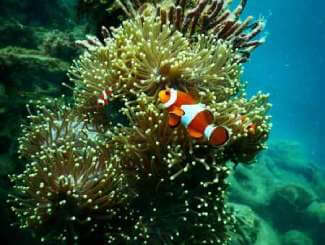 More than hundred different dwellers of the sea live in 22 aquariums. Among them you can observe the typical canarian species like Tigerfish, Gilthead or Chromis in divers morphologies as well as Clownfishes and their relation to Anemones, fluorescent firedragon fishes, Puffers or Hermit crabs. There is lots to discover! Furthermore, you get to the central pool through a underwater tunnel, at which you can marvel at different types of sharks and how they make their circles. A special attraction offers the petting pool, a kind of petting zoo for seafood, where kids and grown-ups are allowed to touch animals like the Sea cucumber or the Starfish in order to get to know them better. The Rancho Texas Park is located in the south of Lanzarote. The park has many attractions for children and adults like swimmingpools, a restaurant, water games, a gold mine, exhibitions, pony riding, canoeing and exotic animals. Furthermore, the different shows like the birds of pray exhibition, the sea lion show, the parrots and cockatoos exhibition and the Cowboy lasso and whip exhibition take place every day and are amazing adventures especially for children. The Rancho Texas Lanzarote Park is open every day from 9.30 am to 5.30 pm. When darkness rises bars and clubs located all over the island awake. You can experience unique locations integrated in volcanic rock, with exclusive decoration right on the beach. For every taste of music something can be found, international music as well as Latin American music. Cuban dancers care for the tropical athmosphere. On Lanzarote the following bars and clubs allow you to get an insight into the Canary nightlife. Lanzarote is not the place you are looking for?